People Make Glasgow. 24 hours in Scotland's second city discovering it's food, drink, culture and humour with a focus on the resurgence of Merchant City's Miller Street. My first experience of Glasgow was back in 1988 at the Glasgow Garden Festival. I have amazing memories of this family holiday and vivid recollections of the Rotundas, Finnieston Crane and the Bell's Bridge. Another major experience was the Commonwealth Games in 2014 where we saw gymnastics, athletics and the cycling road race. In the intervening years my sister studied for 4 years at Strathcyde Uni in Glasgow and I've visited on various occasions for gigs, shopping, the world pipe band championships, my hen night (Victorias Nightclub!) and even to sing with Rock Choir at the Royal Conservatoire. Over the years Glasgow's branding has had various reincarnations. Glasgow's Miles Better, Glasgow City of Culture, Glasgow – Scotland With Style and the current People Make Glasgow. Whatever the tagline the city always has a real buzz about it, there's plenty of weegie banter, humour, warmth and friendliness to be found in Glasvegas. 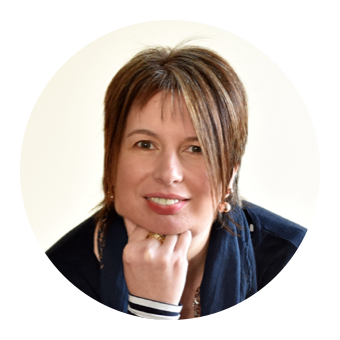 I travelled to Glasgow on a Scotrail train along with fellow Aberdeen blogger Anastasia of Natbees. Rail is my absolute favourite way to travel from Aberdeenshire to the central belt. It takes all the hassle out of driving and parking, the onboard wifi enables me to catch up with work and the train takes you straight to the city centre, in this case Glasgow's Queen Street Station. The itinerary for the weekend was to explore the 'Miller Street Massive'. Miller Street lies slap bang in the middle of the Merchant City area of Glasgow and is undergoing somewhat of a renaissance. 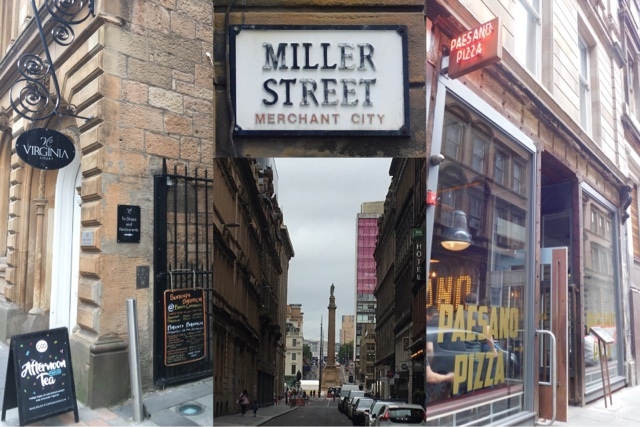 To find it, come out of Queen Street Station at the George Street exit, turn left into George Square, then right at the Sir Walter Scott Column crossing the square into Hanover Street, cross Ingram Street and you'll be in Miller Street. Literally 5 minutes from the station so a perfect central location. Out hotel and three eating/drinking venues were all within stumbling distance of a couple of hundred yards. Time to check into Ibis Styles Glasgow. The hotel reception is located on the first floor and it's contemporary Glaswegian vibe hits you as soon as you step into the lobby with the greeting of 'Have a Belter'. 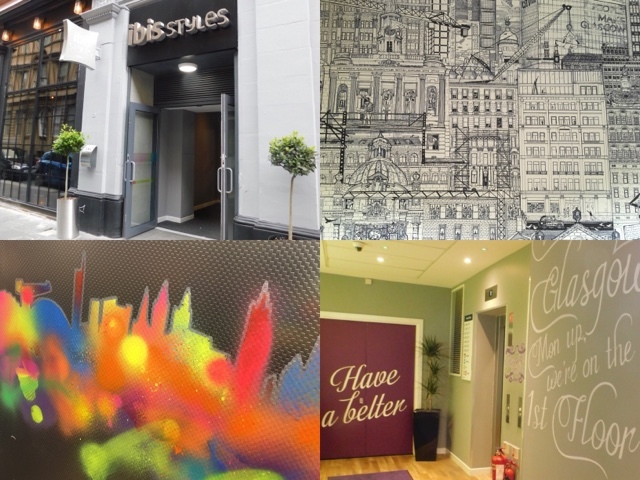 A lift with graffiti depicting the Glasgow skyline took us to check in at the open plan reception come bar/restaurant/breakfast room which is adorned with iconic emblems of the city and its people. 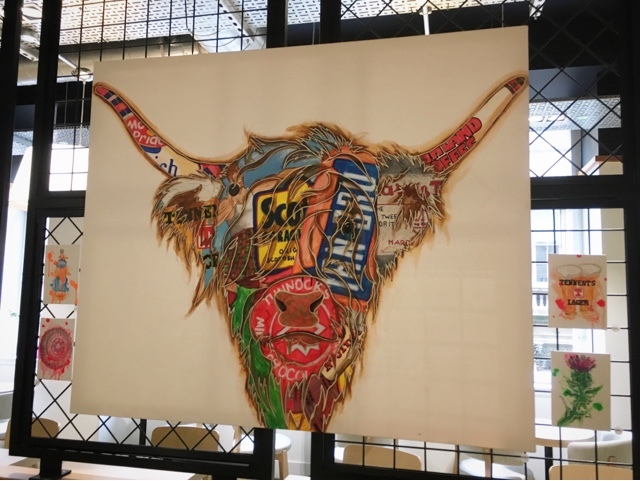 Fantastic artwork on display from Hee-Haw, loved the highland cow! 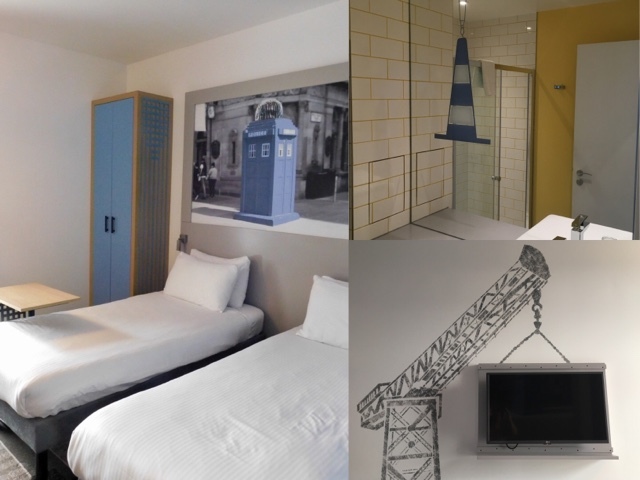 Our twin room continued the theme with traffic cones, tunnock's teacakes, finnieston crane and police phone box. Plenty of photo opportunities to be had and some lovely goody bag and basket treats both from Ibis and People Make Glasgow. 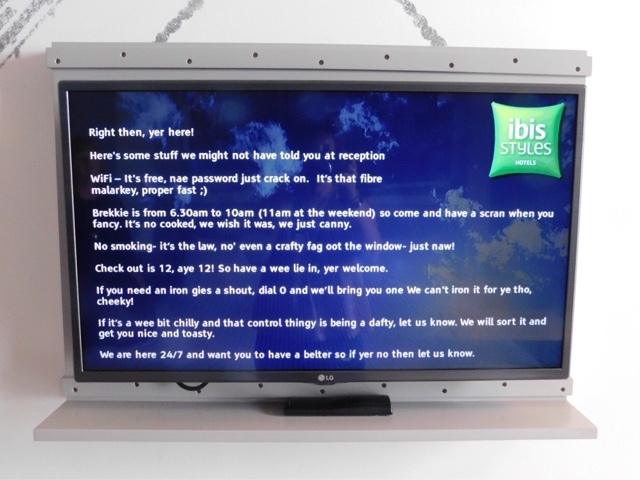 The welcome message on our TV was spot on, although I do wonder what non Scots may make of the lingo! Our 7th floor room was modern and practical with comfortable beds and an excellent shower. The air conditioning was spot on - nothing worse than a stuffy hotel room. There were power points in all the places that there should be - next to the bed for your phone and beside the mirror for your straighteners! USB ports too. We didn't hear any outside noise which being so central was surprising - but very welcome. Breakfast is included in the room rate and was continental and plentiful in style, there's also self service pastries, fruit, tea and coffee available 24/7 in reception which is a nice touch if you get peckish. Most definitely a hotel I would return to without a doubt. 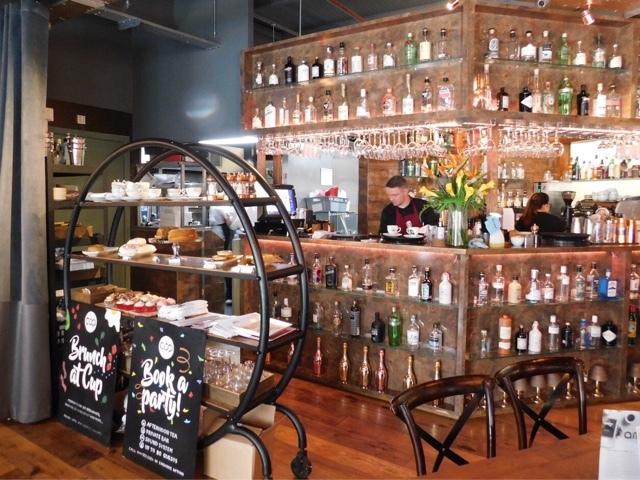 The first scheduled stop on our itinerary was Afternoon Tea at Cup Merchant City. Cup is located in Virginia Court, just off Miller Street. By day it is Cup and by night Gin 71. My interest was instantly multiplied! Regular readers will know that Gin is VERY much my thing. 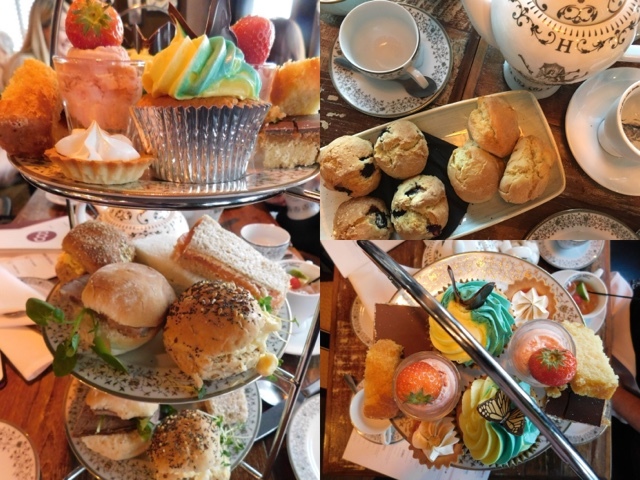 They offer a selection of Afternoon Tea menus including vegetarian, children's, teenage and gluten free. Cost per head is £20 with upgrades available to include prosecco (+£2.50) gin or cocktail (+£5) or Champagne (+£7.50) They also do Gin based sharing Cocktails served in a Teapot. We tried all three of these before moving on to Breakfast Blend Tea. An embarrassingly conservative choice seeing as they serve over 40 speciality teas. Our Afternoon Tea Sandwiches consisted of Roast Beef with Wholegrain Mustard Mayo, Smoked Salmon with Lemon and Dill, Cucumber with Cream Cheese and Cracked Black Pepper and Coronation Chicken. The cakes were Lemon Pistachio Loaf, Cupcake of the day, Raspberry Meringue Tartlet, Strawberry Mousse and Billionaire Shortbread. For me it's all about the savouries so I cleared the bottom level completely and only had the tartlet from the top tier before moving onto warm from the oven Blueberry Scones with Jam and Cream. We'd all made a really good attempt at what was on offer, but there was still a lot of food left, however it doesn't go to waste as Cup provide take out boxes so you can enjoy the remainder later, a really great idea as at this point after such a wonderful feast I felt like I wouldn't need to eat again for a very long time. We spent the remainder of the afternoon exploring the city on foot and by open top bus. Number one on my list was to track down the recently unveiled Sir Billy Connoly Murals commissioned to celebrate The Big Yin's 75th birthday. These join a diverse range of existing street art within easy walking distance of the city centre. with all three tracked down and duly Instagrammed we jumped on a City Sightseeing Gasgow tour bus. I always think that these are a fantastic way to get your bearings and see as much of a city as possible in a relatively short space of time. We stayed onboard and listened to the live commentary for the whole circuit but you can hop on and hop off at each stop if you so desire. I was surprised and delighted to discover how many of Glasgow's Museums have free entry. Kelvingrove, Riverside, People's Palace and The Tall Ship are now firmly on my to do list. The sun was shining with not even a hint of west coast rain and it was lovely to see the city in its full glory thanks to the 'taps aff' weather. 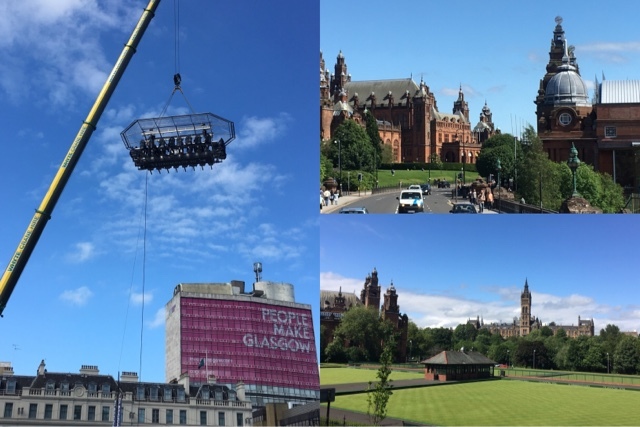 Only wish I could have sampled dining in the sky suspended 100ft from a crane in George Square. As the sun began to disappear it was time for pre-dinner drinks a couple of doors up from our hotel at SoHo. (84 Miller St) Clearly a popular place for both cocktails and eats. I opted for a rather wonderful Salted Caramel White Russian (£6) while my plus one went for Pear, Ginger & Raspberry Mule (£6). By this time our afternoon tea had worn off and bellies were beginning to rumble. Time to move next door. I must admit that when I saw that dinner would be pizza my heart sank a little. Was this really the best the city could offer me? However Paesano (94 Miller St) was as far as it is possible to be from the stereotypical image of Glaswegian deep fried pizza. Clearly a very popular place to dine as there were queues out the door (they don't take reservations) of folk waiting for a seat or to collect take away orders. There's is a lot to be said for a limited menu that's done really well and that's most definitely the case here. 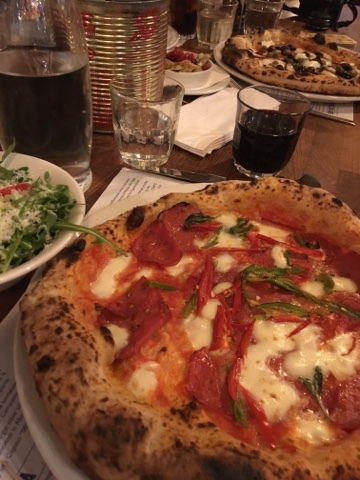 No starters, 8 Pizza's (£5-£8), a couple of specials and a handful of sides (£2-£4). However they do let you mix and match the toppings to create a bespoke pizza - but definitely no pineapple! Some confusion over a rather exotic sounding ingredient followed by much hilarity only to find out that evvo is simply extra virgin olive oil. 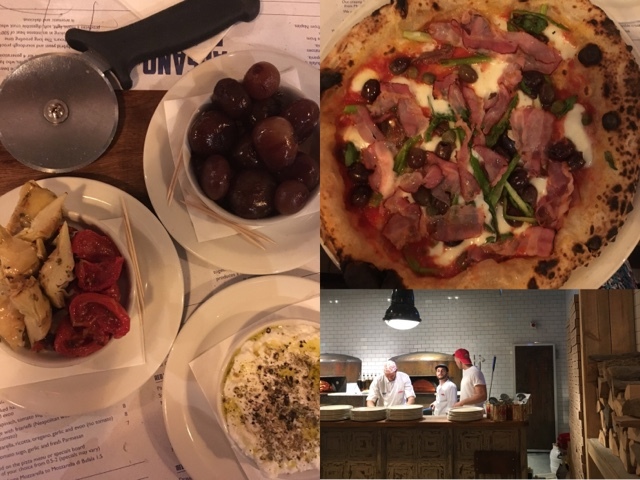 I went for a Number 3 - tomato sugo with capers, olives, anchovies, mozarella, garlic and evvo. I couldn't resit adding pancetta and asparagus. My prosecco arrived in a tumbler which surprised me somewhat, but I can live with it's rustic presentation as it suited the situation. Very shortly afterwards our Pizza's and sides began to arrive. The artisan built wood fired ovens from Naples cook at an intense heat of 500c which means your food is ready fast. We'd already made a start on the sides which included absolutely amazing balsamic onions. These I'm going to have to try and recreate. However the Pizzas were undoubtedly the star. Thin puffy crusts, just the right amount of topping and absolutely amazing flavours. Normally I'd avoid the crusts, but not these. Sourdough proofed for 48 hours mean they are moist, light, digestible and absolutely amazing dipped in a side of fresh ricotta. Now I knew exactly why all those folk were queueing outside. Stupidly we all ordered desert, big mistake, much better just to stick to a coffee. Another top tip for future visits. 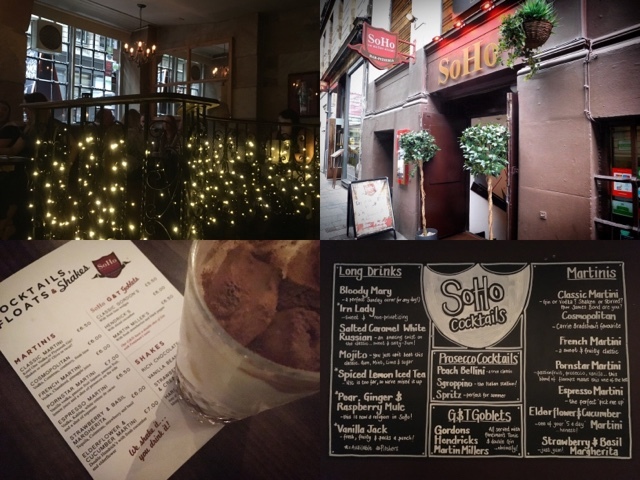 Disclosure: We stayed, ate, drank and explored as guests of Glasgow Life, Ibis, Cup, Soho and Paesano. 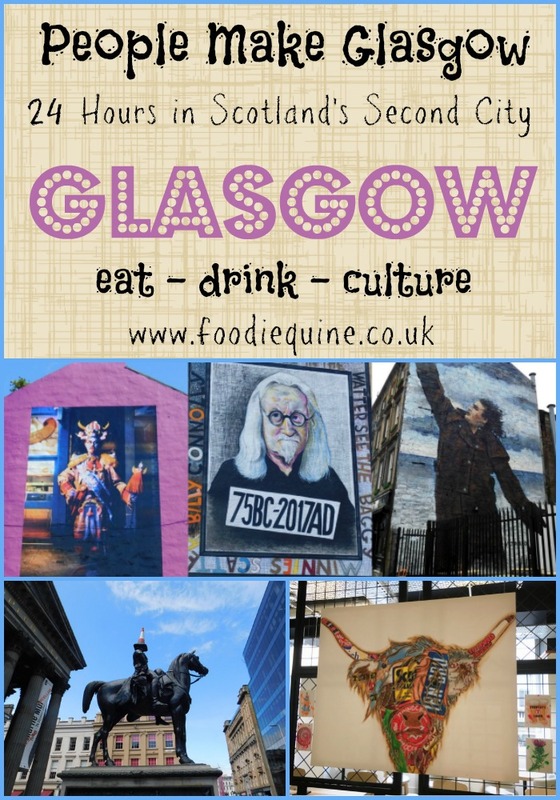 I never knew so much about Glasgow!! I've been once for work (when I worked for bmi) but pretty much flew in, went to the hotel, meeting, flew out. It looks like a great weekend break city destination! Yup it would be perfect for a long weekend, so much to see and do (and eat!) You must come back for more than a 'flying' visit. I've been to lots of great gigs in Glasgow, it does tend to be the main stopping off point for bands in Scotland. Hope you get the chance for a longer visit sometime soon. I have still never been to Scotland and this makes me want to even more! I love that welcome screen, brilliant! My OH flew up to Glasgow from Bristol recently (and drive back the same day with a new car - just mad) and it was easy peasy so I have no excuse really! Oh gosh you really must get yourself up here! So accessible by air and rail - or get your OH to drive you. I loved your pictures from Sir Billy Connoly-you found them all eventually! It's amazing how much you can cram into a short space of time in such a vibrant city. Absolutely had to find all three Billy murals. I have a friend who lives in Glasgow, and I've been wanting to visit for a long time. It looks like there's so much to see and discover there! Will definitely plan a trip in Autumn when my boyfriend is around here. Great post! Honestly you will love it! Such a vibrant city with so much going on. And super friendly people too. I could have sworn I'd commented on this post, but I'm easily confused this day. 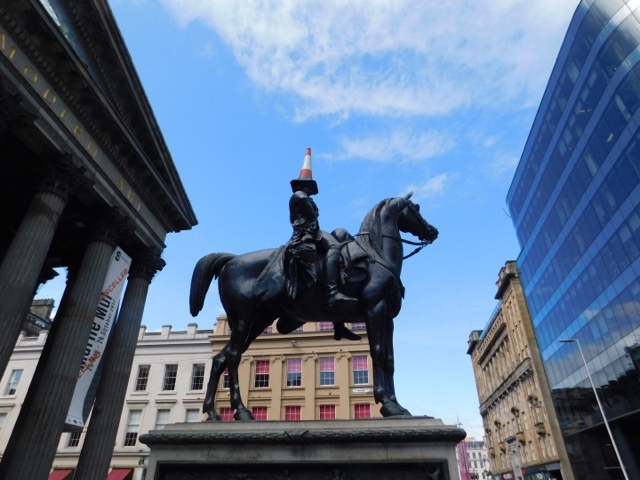 I remember the horse and hat statue :D It's been many a long year since I last went to Glasgow and have to confess I know Edinburgh much better. But I'd love to visit again for sure. I think you might have commented on my Instagram photo with the same pic. Like Choclette, I was sure I'd already commented on this post! I wonder if it got lost in spam? Anyway, what I had wanted to say was to raise a glass at your reminder that Glasgow is such a warm and amazing city, with history, culture and great food. I think there's this silly stereotype of Edinburgh as having all those things and Glasgow is just a city of drinkers, but it's so daft, Glasgow is FAB! I guess being the capital, Edinburgh is where tourists tend to head but Glasgow had so much to offer - just in a different way! Glasgow is a fabulous place. So much to see and do. Love that hotel. It's a pet hate of mine when there is no plug beside the mirror for my straighteners. I really want to see those murals for myself too. 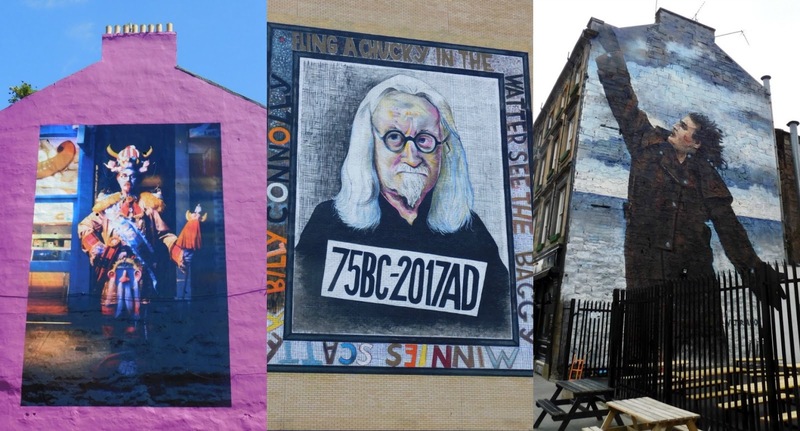 The murals are such a great addition to Glasgow's amazing collection of street art. Great place to be a student. My sister studied at Strathclyde Uni. Oh there's so much I love about this post - Billy Connolly street art, Highland coos, gin, artisan pizzas and, most of all, that cracking message on the hotel telly! Brilliant. I really need another dose of Glasgow. We loved it on our last visit. We had a great meal at the Ubiquitous Chip. The message on the TV really did make me smile although I suspect many folk just want't get it at all! I visited Glasgow last year and loved the long train ride up the west coast. 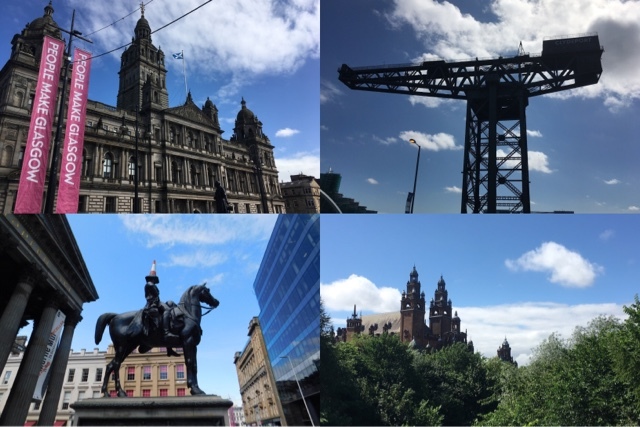 We spent a little time in Glasgow, but used it as a base for exploring Loch Lomond and Stirling. Definitely makes a great base for some west coast and central Scotland adventures but also lots to offer in it's own right. I've never been to Scotland, let alone Glasgow! It looks like a great city, and I love the message on the TV screen!! When you do finally make it to Scotland definitely put Glasgow on your to do list.